“Changes, changes, changes” at FXstreet.com! New navigation, new menu and new pages on our website. Why? A more logical and easy-to-use website. We’ve been studying how to improve the user experience on our website and help traders to find and access our tools and most important pages more quickly. The Economic Calendar is now a point on the main menu. The Fundamental section disappears. 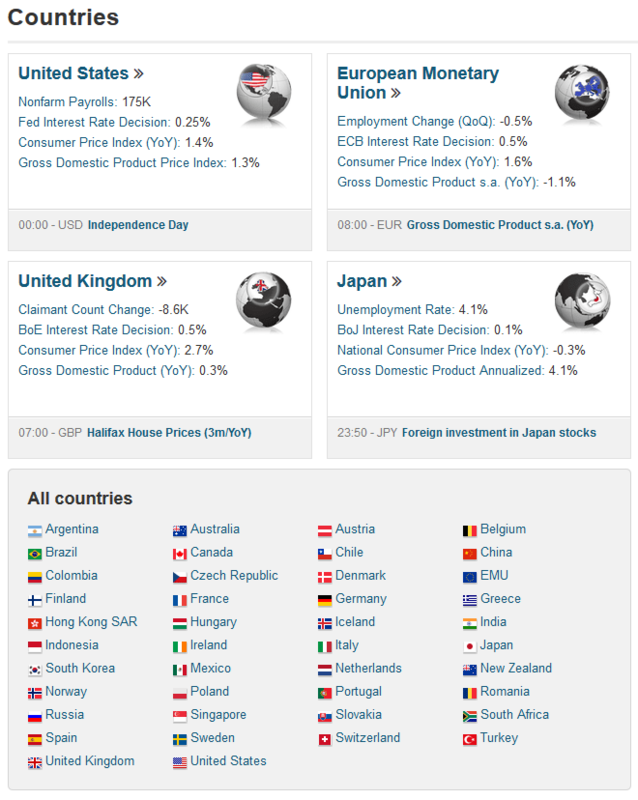 We’ve also created a “Countries” page where you can browse all economies that are covered in our economic calendar. These pages contain basic data about the country, graphs with the economic releases and currency pairs. The World Interest Rates table will still be available on our website but under the Economic Calendar section. The Technical section is maintained but sees its content profoundly changed: it will contain the Currencies-at-a-Glance tool (now called “Currencies“) and the My Studies dashboard with their customizable widgets. A new section is created: “Analysis“. It gathers all the reports published on our website by our own team and by all our external contributors. The reports will be classified in different categories: Macroeconomics, Technical Analysis and Trading Ideas. There will also be two new subsections for some of our most popular tools: the Current Trading Positions table and the Experts Forecast Currencies Poll. Finally, the Platforms section is not on the menu anymore: it will be available under the Brokers section. This page offer a list of Expert Advisors and Technical Indicators to be integrated on trading platforms. So the x button doesn’t work. There’s an OK button but can be seen when exiting. Thanks for your message and sorry for the inconvenience. The chart on this page is overlaping the “I got it” button through which you would be able to close this gray layer. Go to http://www.fxstreet.com and close it from there by clicking on the orange “I got it button”. Thanks and we’ll try and fix that bug you found! I want to be updated because of very informative and useful site which help me for my forex planning and day to day requirement of forex. Kindly indicate how I can find these reports. Our reports are now published under 3 new categories: Macroeconomics, Technical Analysis and Trading Ideas. I only want to see the live forein exchange currencies. I am just trying to get to the economic calendar with no luck. How to? Hope it helps. We’ll try and have this bug fixed asap! Dear umair, the bug was fixed and you can access all your reports from your Watchlist as usual! no matter how many times I clicked the orange “I got it” button, the website doesn’t respond. Can’t you just remove the gray layer off? As agreed by email, and since all the solutions we tried to fix the problem aren’t working, we’ll remove the gray layer with the change information message from IE. Sorry again for the inconvenience and thanks for your patience. I can’t access fxstreet.com. The annoying “Got It” overlay won’t go away. Can you please turn it OFF! Dear Jim, we’re sorry for the inconvenience. It was problematic on Internet Explorer and we removed it there, and it should work fine on other browsers too. It is a great progress to see how your site has been restructured. All information required is present at a glance . I surely will recommand to my friends and wish you success and great recognition. Uzair, can you please let us know what does not work for you so we can assist? Thanks! If you allow cookies in your browser, once you’ve close the gray layer, it will not appear again 😉 The gray layer will be removed later this week anyway.